A Berkshire couple returned home to find their house had been set on fire by their 70-year-old tortoise. Emma, who also has a dog and two baby tortoises, said: “We were out shopping when we got a call from the fire brigade saying that our tortoise had set the house on fire. This entry was posted in Uncategorized on February 28, 2008 by John. This entry was posted in Uncategorized on February 27, 2008 by John. Today Victor Hugo is 206 years old. At which, like they, laughed Punch, with all his bells. This entry was posted in Uncategorized on February 26, 2008 by John. I’ve mentioned it before here several times. It’s my favorite bookstore here in St. Louis. The Book House.. I can’t visit without leaving with a book. No, I didn’t go there this past weekend. However, this month’s Stlbloggers Blog Carnival asks for local paranormal events. And The Book House is haunted by at least one ghost. We are located in a charming Historic Victorian House, built in 1865, about 15 minutes from downtown St. Louis where an eclectic mix of quality rare, out-of-print, new, and used books are tucked into nine rooms on three floors of winding staircases, filled with nooks and crannies and a dungeon we call the “Bargain Basement”. Our house is patrolled by two store cats Chaucer and Blake as well as at least one documented ghost. That comes from the store website. As legend has it, there is a small chamber on the second floor of the Book House in Rock Hill that was the favorite playroom of a little redheaded girl. It’s said she was the daughter of a nineteenth-century prostitute and may have drowned in a creek that once ran alongside the drafty farmhouse. Her restless spirit lives on, or so the story goes. That’s from a June 2006 Riverfront Times article. That article’s main focus was the store’s pending closure. As I posted in October of 2006, the closure had been delayed “about a year or so.” We’re up to the “year or so” mark, and there are no hints on the website at least that it is pending. I think perhaps the Ghost (whose name is apparently Valerie) not only helps patrons find books, but is helping the store stay alive. This entry was posted in Uncategorized on February 25, 2008 by John. Nader has announced he’s running again. I insist on taking the optimistic attitude and agree with Southern Beale’s analysis. He did so poorly in 2004 (0.38% of the popular vote) that there’s no reason to worry. A humorous story about a boy and his pony. I haven’t mentioned the “Great Animal Rebellion” for a while. I think this might fit in there somewhere. This entry was posted in Uncategorized on February 24, 2008 by John. This entry was posted in GAR on February 24, 2008 by John. The BBC is asking for ideas on how to update some metaphors. The inspiration appears to be the declaration that a bridge in England will finally be painted after 100 years of painting. Since the task began, a job that takes so long one has to start over again immediately has been compared to ‘painting the Forth bridge.” But they’re predicting they won’t have to start again for at least 25 years, so it no longer applies. My suggestion: Put the comments before the blog post? I’m not certain this is outdated yet. The BBC states that several British stores no longer accept checks. And many American stores won’t either. However, the banks do. A blank check still has the same power. This entry was posted in Uncategorized on February 23, 2008 by John. I think the Czech police should question David Copperfield and see where he’s been lately. 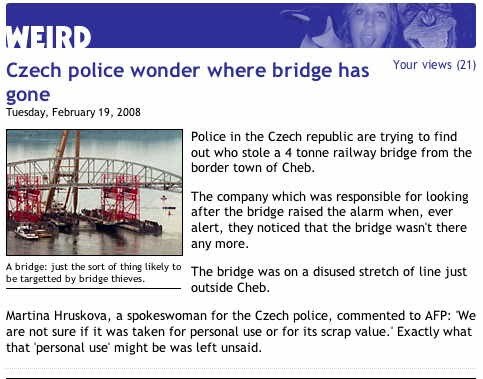 There apparently have been bridge thefts in Russia as well recently, and I haven’t heard anything about Copperfield in the US for a few years. Maybe he’s traveling. This entry was posted in Uncategorized on February 22, 2008 by John. A) Reply back to the travel agency, inform them they made the mistake, and provide them with the correct address, and where you found it. B) Forward the itinerary directly to the intended individual, so that they know the travel agency made a mistake. 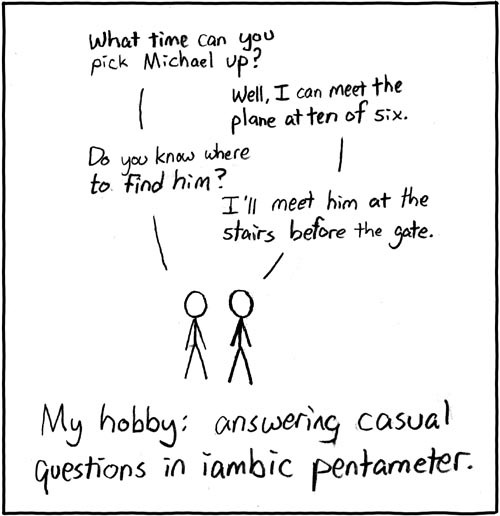 Do you think what you would do might change after repeated instances? Would it matter if the person was involved in politics whether or not they agreed with you? Would it matter if the person was politically active in a foreign country? This entry was posted in Uncategorized on February 21, 2008 by John.